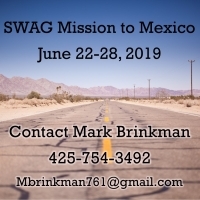 Mark & Leslie Brinkman are leading a team back to San Quintin, on the Baja Peninsula of Mexico, and they want to invite you to come along this time! In past years, they have lead teams from the youth group,and they always come home raving aobut the miracles they experienced! This year they are opening it up to anyone who wants to Love God, Love Others, and Serve the World in a very personal way. During this week long trip the team will serve the families and churches of San Quintin, an impoverished coastal community that is about 5 hours south of San Diego, through Vacation Bible School, crafts, sports, evangelism, prayer and much more! The cost of the trip is $495 per person,plus airfair, ground transportation and San Diego hotel. Individual cost is dependent on fund raising. Mark or Leslie would love to talk to you about it!